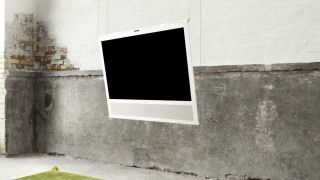 Bang & Olufsen has announced the arrival of the first TV from its BeoPlay range, the BeoPlay V1. The television is something of a designer's dream. Made from two sheets of metal and inspired by origami and the Bauhaus art movement, B&O has seemingly made this TV for people to look at as much as the content that will be played on it. Usually, this sort of design from B&O means having to take out a second mortgage, but Bang & Olufsen is pitching its BeoPlay range at a price point that won't mean a call to the bank manager but just a reassuring text instead. The BeoPlay V1 comes in both 32-inch and 40-inch sizes and with its own integrated sound system that's thankfully not rubbish. This is because there are three Class D ICEpower amps in the TV and you can add extra speakers if you want straight to the TV as the the integrated 5.1 surround module and speaker/subwoofer connections are all there and ready to go. When it comes to screen specs, B&O is using a side-lit LED panel that works at 100Hz. B&O is also showing its love for all things Apple with this television by offering space in its backplate for an Apple TV to slip into. This means that you can have the system installed without having to look at Apple's unsightly box. The remote also means that third-party devices will work straight from the one control which is something of a bonus. The B&O BeoPlay V1 release date is 2 May (Europe only) and pricing starts from £1,999. For the rest of the world, the release date is just May. Oh, and for those who like to make a stand, B&O is offering up a variety of stands for the BeoPlay V1 – including the ability to suspend the TV from your ceiling using wires. If you do actually do this, please send in pictures and we'll make a gallery or something.